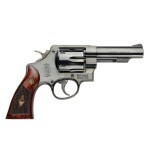 Summary: The manufacturer’s description and specs, and the average user rating for the Smith & Wesson Model 58 revolver. 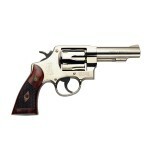 Smith & Wesson’s Model 58 is a six-round revolver with a carbon steel frame and wood grips. Finish options for this single/double-action pistol include blue and bright nickel. .41 mag 6 9.25″ 4″ 40.8 oz. This entry was posted in .41 Magnum, $1,001-$1,250, $751-$1,000, Full size, Revolver, Smith & Wesson on June 17, 2010 by Staff.